Hey there! Welcome and I’m so glad you are here! Do you have a car-loving kiddo in your life? My three boys are all big into cars and have been since they could hold things in their hands. And, I’ll admit, I have a thing for fast cars too. I am an adrenaline junkie and fast cars are definitely good for that! And with my three boys, it seems faster is always better. We have been collecting diecast cars since my oldest was finally old enough to play with them! And a couple summers ago, my brother-in-law gifted us a HUGE collection of them. Which we gladly accepted. But what is a race car with no where to race? 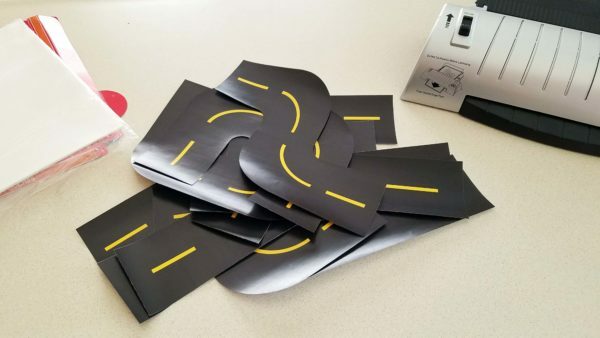 That’s why your little ones will LOVE this DIY Toy Car Road Set! 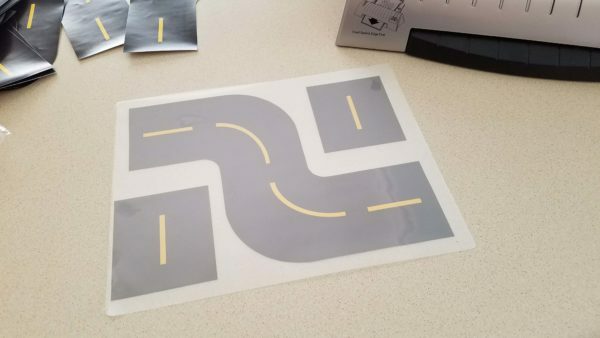 EVERY TOY CAR NEEDS A TOY CAR ROAD! Now that we have all these super cool cars to play with, I was itching for some fun play road time. Giving kids the chance to free play is high on my list, but sometimes it’s fun to have a little guided play too. This DIY is the perfect way to combine the two. 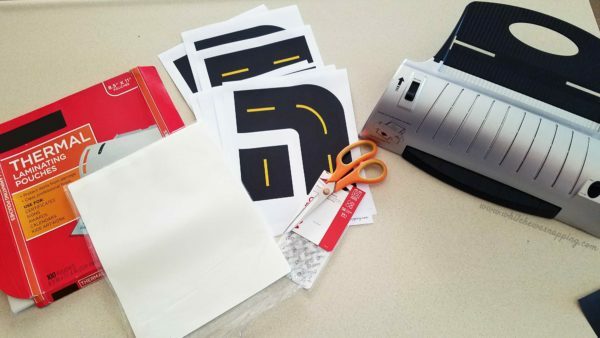 Make your car-loving kids this printable toy car road track set for their cars, because what’s a race car with nowhere to race? The best part? It’s reusable and there is no right or wrong way to play. When my kids feel like they are in control of play time it tends to lead to longer and more engaged play, which means I can cook dinner without tripping over little boys in my kitchen. 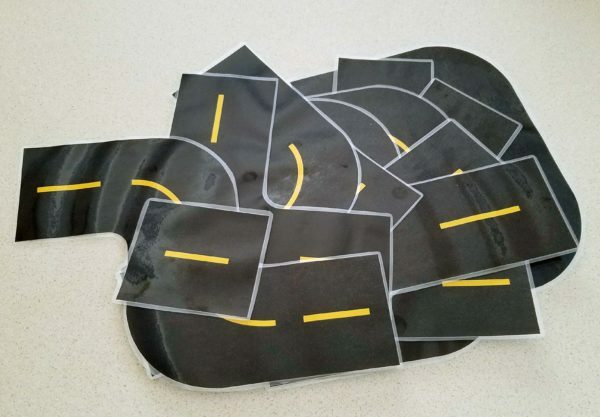 Between their imaginations and this DIY toy car road, they should be happy for quite a while. Life with kids is great, but play time can get rough and tough. A paper toy isn’t bound to last long in my house. Yours either? 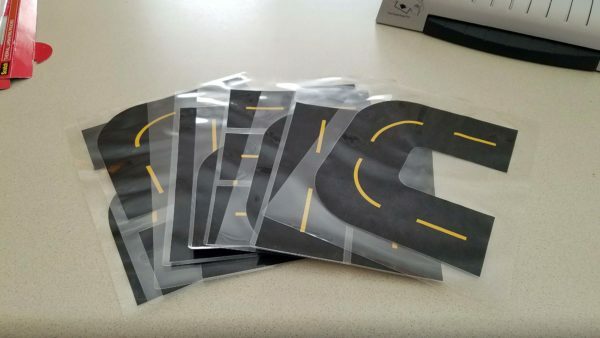 Well, I’ve got a few tips so you only have to print this toy car road once and to help it last as long as possible once you let the kids loose. Ready? Let’s do it! Print the track pieces. 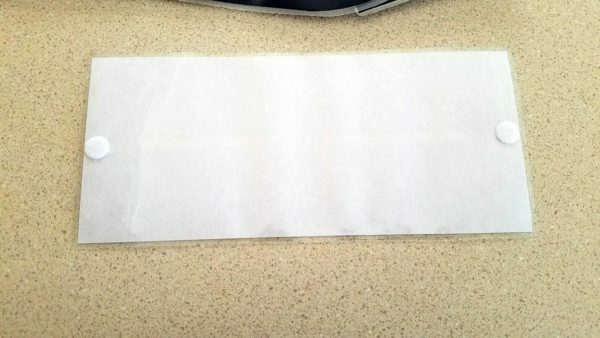 I suggest a card stock or other thick paper for durability. You may want to print more than one copy of the pieces, so there will be more to play with. This tutorial uses 2 sets of the color track set. Cut the track pieces out with the scissors, getting as close to the edge of the road as you can unless you want a white border on the edges. Laminate the pieces. 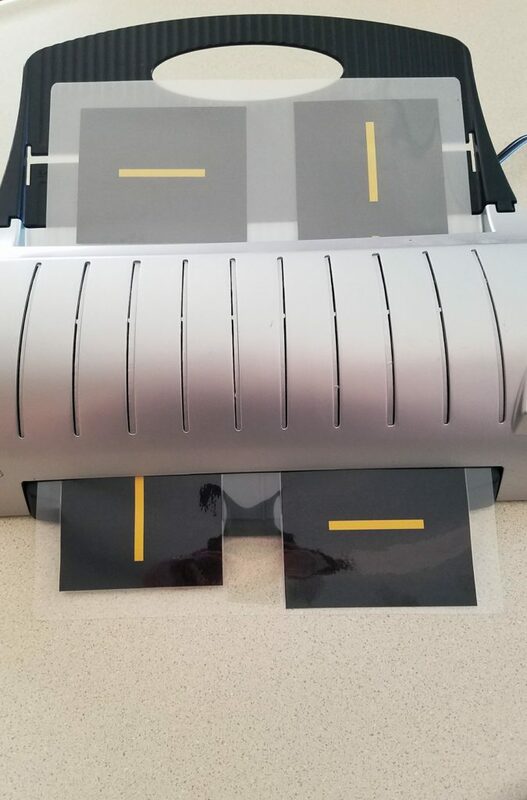 I prefer a thermal laminator, but you can use self-laminating sheets too. Follow the directions on the packaging to get the best seal. A thicker sheet or pouch may help your track pieces last longer. I use these thicker 5mm ones and love them. Cut around the track pieces with the scissors. Make sure to leave enough border so the seal stays intact. Attach the hook and loop fastener dots to the ends of each piece. Put the hook pieces on the front side of the track pieces and the loop pieces on the underside. This makes it so you can rotate the track pieces. Repeat for each track piece, trying to get them as close to the center as you can so they will line up. That’s it. You’re ready to play! Store pieces in a ziptop bag or other container with a couple of cars so you’re always ready for some race time play! Not much room to play? Only get out a few track pieces out for a compact track. Or go all out and try to use all the pieces! 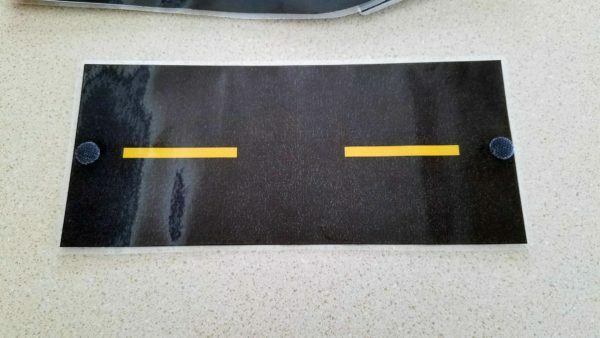 NEED A TOY CAR ROAD THAT WILL LAST? Let’s admit it, this version is pretty simple and not terribly expensive. A year later, ours is still in pretty good shape, all things considered. But, it definitely has some wear and tear on it. 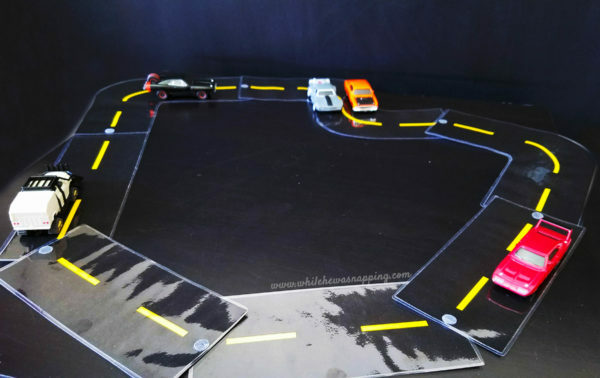 I’ve had to replace a couple of the hook and loop pieces and we’ve had things spilled on the pieces, like half a bottle of bubbles… So, if you’re looking for a toy car road set that will hold up just a bit better you should really check out this Felt Road Track. It takes slightly longer to create, but the pieces will hold up better – and just toss them in the washer if they need a quick cleaning.